I am SO excited about this dress.....it is the latest design I am working on and it has morphed from my original idea into something I love even more. I am calling it the "Sunday best" dress. I will be adding it to my sewpony vintage shop (which will switch from etsy to my blog shortly)!! I first drew up this design a couple of months ago but it looked a little different. You may have seen the original version here. I was planning on offering to lengths of bodice and a gathered skirt with or without collar and with/without two lengths of sleeves. 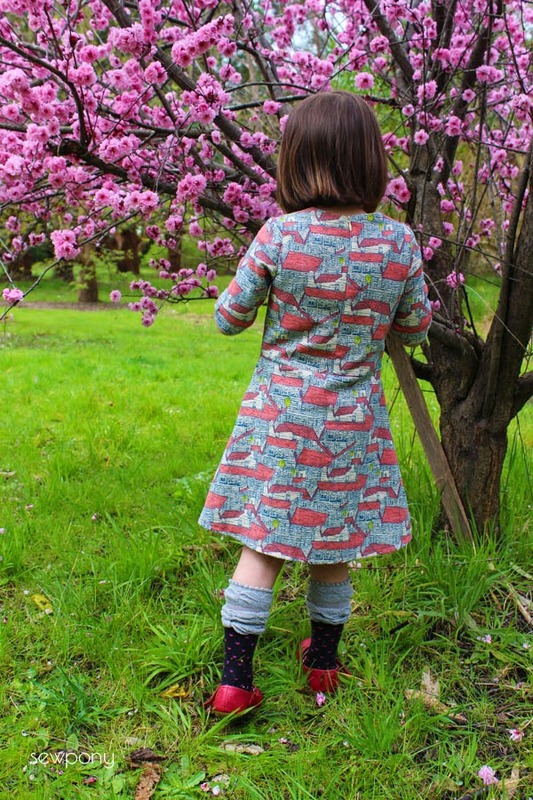 However, I really wanted to use this beautiful fabric - wooden houses (not currently available in the pink colourway but the green version is just as gorgeous) that I purchased recently from fellow Aussie, Frances from Miss Matatabi (I am her latest fan...), but I only had one metre. I decided to eliminate the gathered skirt option and instead drafted a simple A-line skirt. 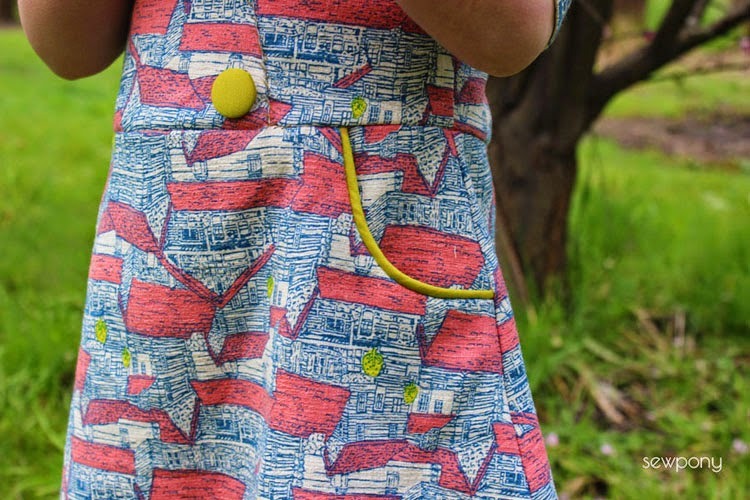 The dress needed something else to tie in the chartreuse colour of the collar (which was intended to pick up the hint of chartreuse in the houses fabric - the little trees). So I added little curved pockets to the skirt with a piped edge. And also three covered buttons for a bit of pop! The collar fabric is from my local fabric shop and seems to be like a shot silk of some variety... please don't look too closely at my hand stitching along the diagonal bodice line - I was doing it late last night under dim light and should have chosen a different colour thread!! Our garden is looking beautiful at the moment, and we have one tree in full blossom as you can see! We are not sure what fruit it will produce yet, but it is a stunning backdrop I think! The bodice is lined and closes with an invisible zip.... no hand sewing the lining into the zip on the inside...I figured out how to sew it in with the machine really simply. You can see the back detail here - the half collar is sewn into the shoulder seam. I have been bursting with ideas lately with two other dress designs swimming around in my head. This is thanks a lot to the incredibly skilled and talented blogger, Lauren Dahl. 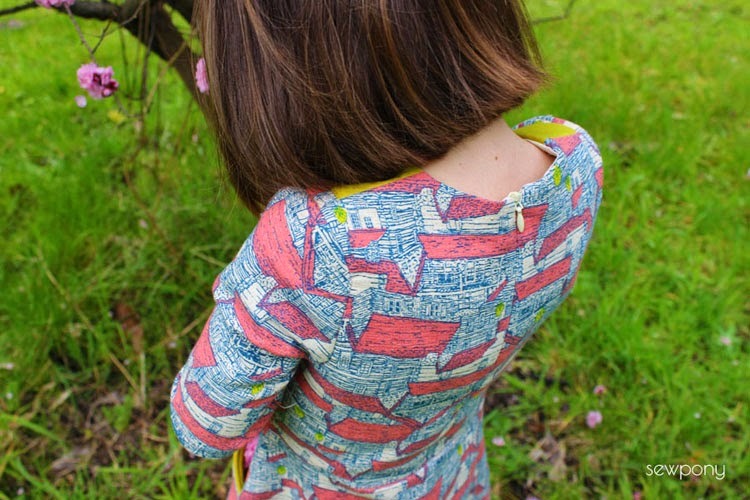 Her pattern workshop course is sooooo helpful and although I am only a little of the way through it so far, it has really taken a lot of the headache out of pattern drafting and compiling a PDF pattern. I know as I learn more through creating this pattern, the ones that follow will become even easier! Thank you Lauren! I am hoping this pattern will be ready for testing in around 3 weeks. It will offer collar or no collar and instead a piped neckline, A-line skirt with piped pockets, buttons for front detail, sleeveless, elbow length sleeves (see here) and three quarter length sleeves. It will be sized 12 months - 10 years. So what do you think? 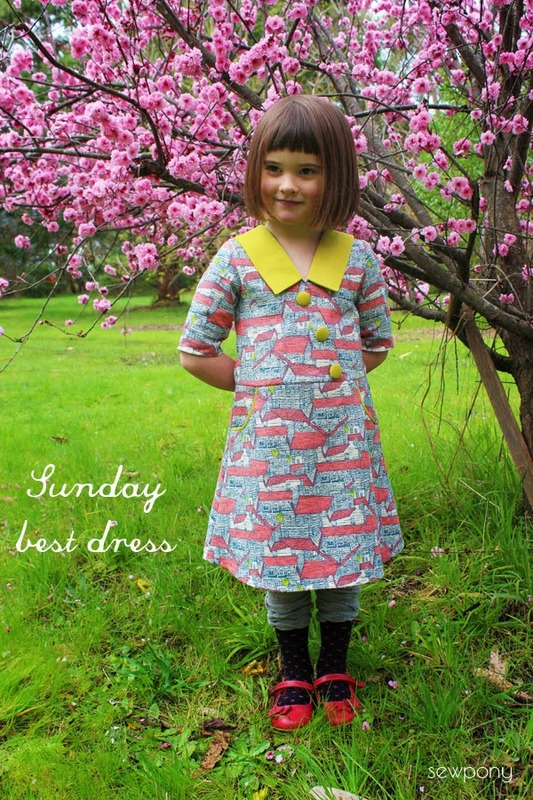 Will you be making a Sunday best dress this September?? I'm excited. This is exactly what I have been looking for for weeks now. 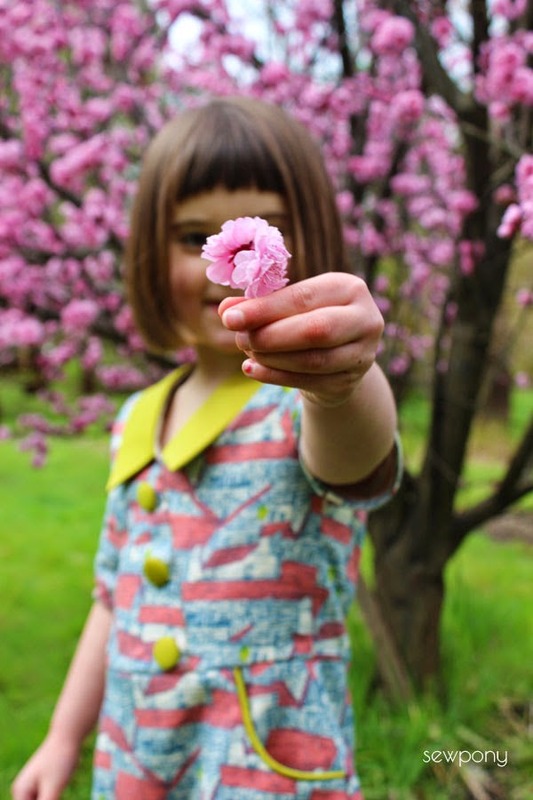 A dress with longer sleeves (fall is coming up here) and a vintage twist to it - and this pattern will have even more options. Yes! I'm looking forward to it an will start the fabric hunt - all over Germany 😉 - now! Shut the front door! This dress is fabulous and we. NEED. It in our fall wardrobe. Need. Seriously. 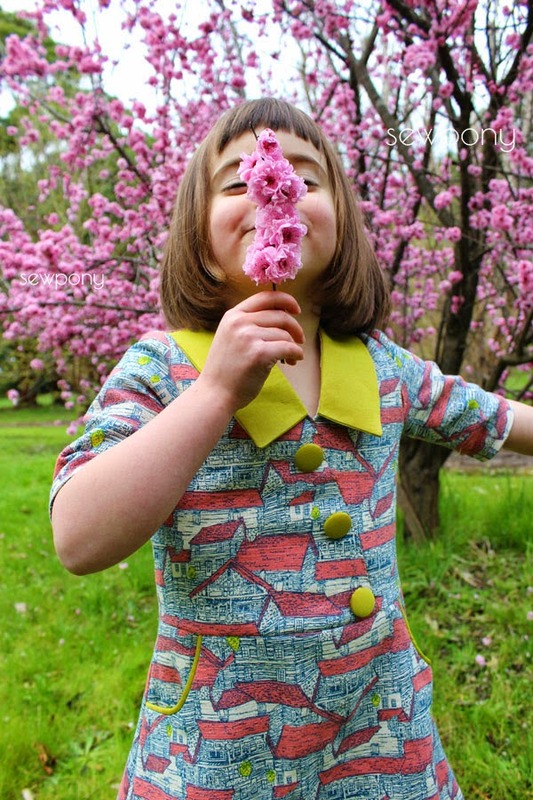 The Cosi got us through summer in glamour, now we must have this to continue through fall! Cannot wait, and will be watching for a pattern tester call-out!! Thanks girls!! I am tres excited too!! Suz - it's fantastic!!!! You've done it again! Can't wait to try this pattern. oh Suz, love this dress! The details are simply perfect! This is gorgeous! yet once again the size stops at 10, why not a 12 for the slightly bigger girls? This is modern looking with special details, you have done a fantastic job! It's gorgeous! I love every single detail of this dress, and can't wait to see the other options... great job! Wow, that's exactly what I've been looking for! A winter dress (with sleeve) with a vintage look. I love the collar and the three buttons at the front along a diagonal line. All the details are so perfect, you've done an amazing job! I can't wait to make one! 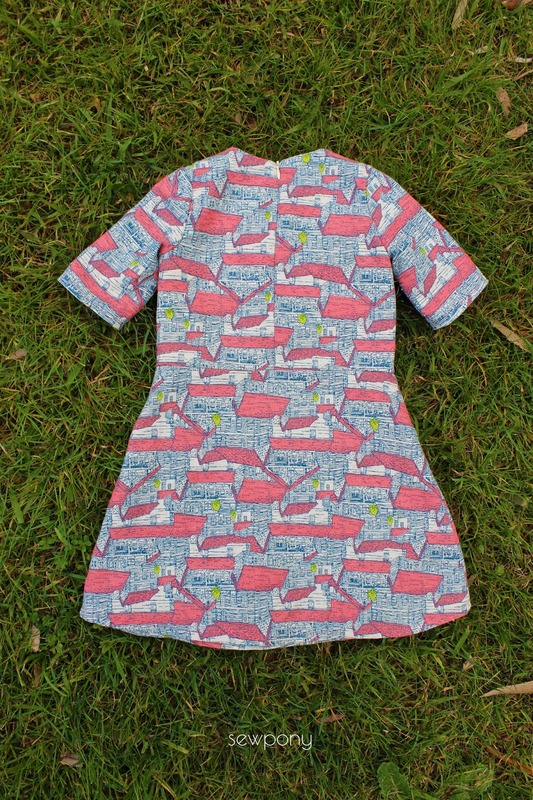 Sundays are for bike riding at our place, but this is such a cute dress I could make an exception! Lovely style, congratulations. Suz, that's great! It's a good autumn/winter option, but also looks like it will work for older girls. I'm really feeling the 'shift' with Missy away from toddler cuteness to something more grown up. 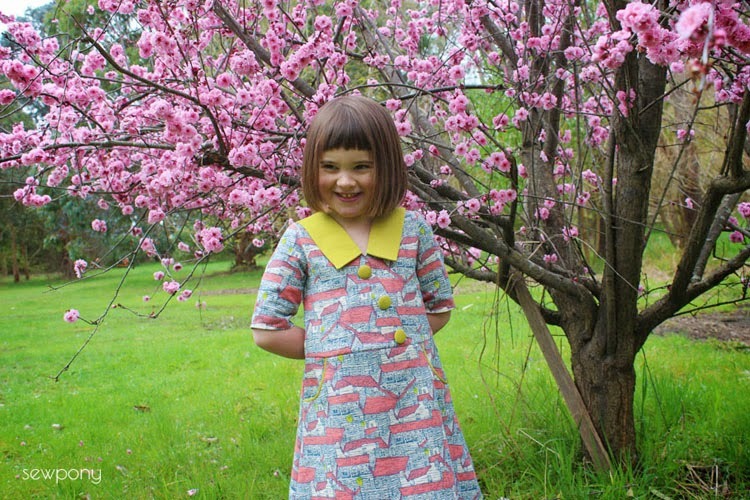 Plus I have a couple of older little girls I'd like to sew for. And love the fabric! And it looks like it has lots of 'flip' potential! This is beautiful, Suz! I love the special collar, and the assymetry in the front. Awasome design!! I love it, looks fantastic!! This a such a cute dress. Wow! I really like this. I reckon Layne could wear this one. The simplicity of this dress is stunning! 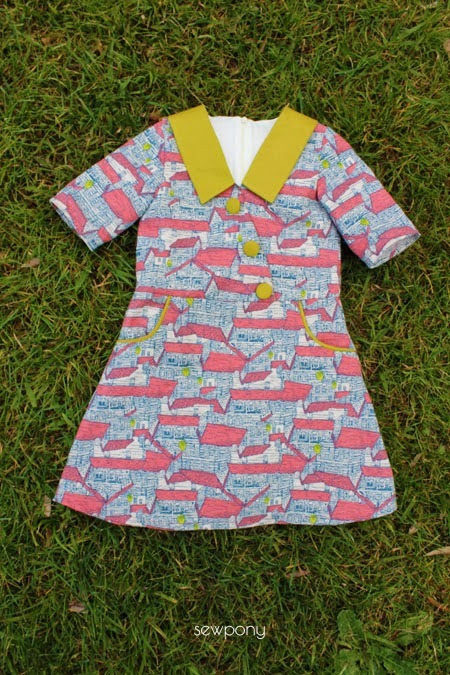 It would make a great dress for my daughter to wear to school! This is so cute! 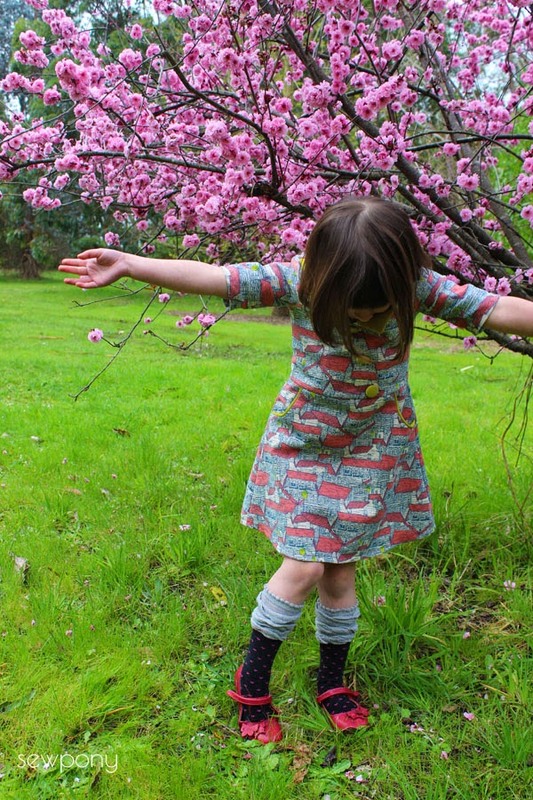 I'm imagining my girl out apple picking in this dress :) Can't wait for the pattern release! I love it! Its so cute! I can't await till my baby girl can fit into it! What a cool dress. Totally mod! We love it very much!I would like to try it! The details of the pockets, diagonal front and collar make this dress truly stunning. 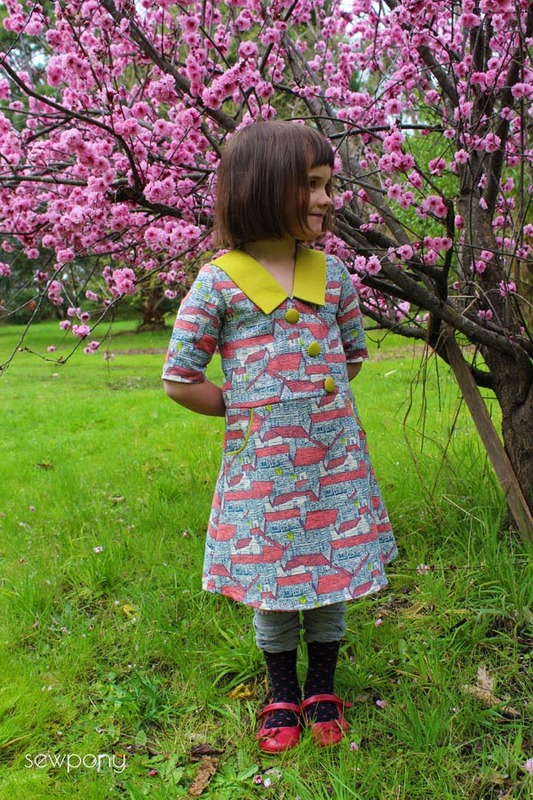 My daughter has asked for A-line dresses and this one certainly fits the bill! Any sort of fabric, cotton or lightweight wool or even pinwale corduroy could work with this design. I think you've hit another winning pattern out of the park! Clever Suz! Gorgeous design, as always, Suz! Can't wait for you to release this new pattern! I love every single detail and the main fabric is gorgeous! "Suz, it looks classic and stylish. You create beautiful designs. 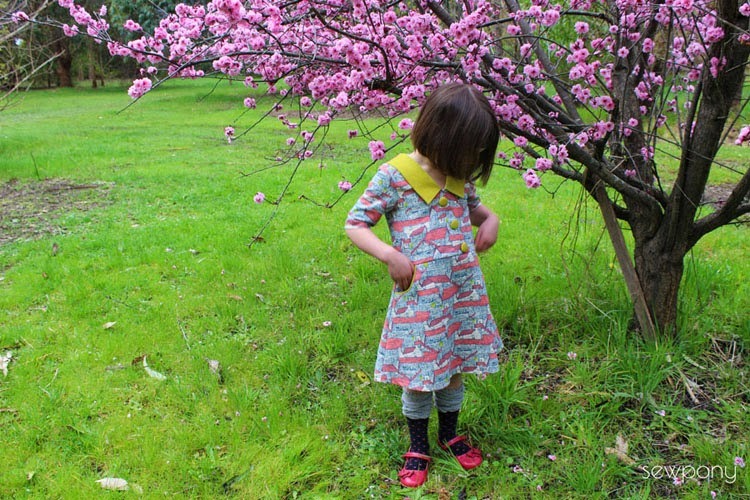 Can't wait to see more dresses created using this pattern." Thanks everyone!! I am thinking I will offer three sleeve lengths - above elbow, three quarter and long. I will think about going up to size 12 but all my patterns are sized differently and I am trying to keep some consistency:) Look forward to showing you the long sleeved and sleeveless version in next couple of weeks!! And such a super-cute model too!!! We now have a little one too - our baby boy was born just over two months ago. It’s all been VERY exciting around here – and VERY busy too!!! I just wanted to let you know that I haven’t abandoned the blogging world altogether – it’s just that some things have been ‘on hold’ for a while.